서울 드랙 퍼레이드와 홍대 마익스 케빈이 협업을 하여 준비한 파티, 헤븐 그 두번째 파티에 여러분을 초대합니다. 다시 한번 활기넘치는 홍대에서 LGBTQ+ 커뮤니티와 앨라이에게 안전한 공간, 그리고 새로운 바이브, 멋진 음악와 드랙, 벌레스크 공연으로 가득한 밤을 선사해 드리겠습니다. 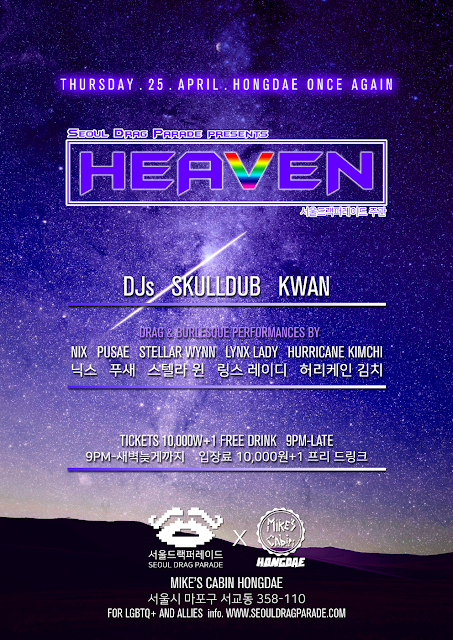 We are inviting you to the second edition of Heaven - a party for LGBTQ+ and allies in Hongdae. Seoul Drag Parade and Mike's Cabin Hongdae have been working together to offer LGBTQ+ community and allies a safe space, and a great night full of new vibes, great music, drag and burlesque performances, at this fantastic, spacious venue in Hongdae.